When the call came through the police scanner, I immediately knew our joyride turned into a very serious matter of life or death. I had a close friend who was a Tuscaloosa Police sergeant when I was in my mid-twenties (which was longer ago than I like to admit!). After signing some releases, I rode around in his cruiser with him during the 11pm – 7am shift. The kicker – it was January 1, 2001. The call came in that a murder had just taken place somewhere deep in the ghetto. My friend told me I could either stay in the police car and risk getting shot, or come investigate the crime scene with him and…risk getting shot. Since I wouldn’t get a gun either way, I went with him to investigate the 1st murder of the millennium in T-town. Genesis 4 records the first murder in history. We must understand the storyline here. God has created everything for Christ and all humanity in His image to rule over the creation. Adam and Eve submit to the serpent rather than to God and they become cursed with sinfulness. Immediately, we see the effects of the curse being displayed in a dramatic way – murder. The sons of Adam and Eve are also born in God’s image but with the curse as well. As the Bible jumps later into their lives, we see Cain as a crop farmer offering a sacrifice to God and Able as a shepherd offering his sacrifice to God. Cain nor his crop offering were acceptable to God, but God was pleased with Abel and his blood offering. Cain thinks, “I am the older brother with the inheritance of my father, but my little brother is accepted by God over me? !” Cain is ticked-off! God warns him by saying that if he won’t be a man (God-imager) and rule over his sin, then his sin will rule over him. But filled with anger from the curse welling up within him, Cain takes his little brother out into the field and kills him. Later on in this passage, there is a distant descendent of Cain who sings a song (and remarkably sounding like a gangster rapper of today) that boasts to his two wives (he got girls) about how he kills anyone who merely wounds him (ain’t nobody messin with him). Why is the curse so strong right off the bat? It’s because of the source behind the curse – Satan. A younger brother triumphing over a sinful older brother, sons being killed to stop the bloodline (Pharaoh and Herod), God only accepting a blood sacrifice with a sincere heart…these aren’t just coincidences here in Genesis 4. Rather, this is proof that there is a specific personality and purpose behind the evil rebellion throughout human history. Jesus speaks about this person who is behind it all from the very beginning (John 8:42-45). He is telling the Jews here that, from the very beginning, Satan is a murderer and liar who opposes the Truth. 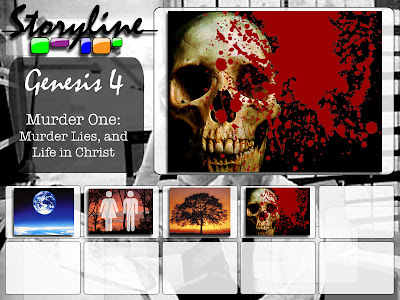 We certainly saw the lying and murdering of Satan in Genesis 3 and 4! Why does Satan do this? Because he opposes the Truth of God, and the Truth of God is Jesus Christ. This is why Jesus says that if you don’t believe in Him and follow His commands, then God is not your Father. Your father is the Devil, and you obey his will. Satan is the father who gives scorpions to his children who asks for eggs and serpents to his children who ask for fish (Luke 11:11-12). He is not out for our good, but for our harm. He is filled with deceit and death. Jesus says that if we don’t love living His Word, then we know who our father really is – the Devil. Satan has a very specific rule over people: his reign of death (Hebrews 2:14-15). His “power of death” gives every human being a “fear of death” which controls them do what he wants. This is much like this group in Uganda who call themselves the Lord’s Resistance Arm. They kidnap small boys from their village homes and command them to kill their family on the spot…or be killed. This “army” rebelling against their government uses death as their power of persuasion. If we’re not careful, we may think that as long as we’re not killing anyone then we’re okay with Genesis 4. But Jesus says that people who hate others are just as liable to His judgment as murderers. Hate and murder have the same power behind the scene – Satan. Who do you hate? Through hate, we may be witnessing the power of death we practice over each other without even entering a ghetto, but Jesus is offering us a life of love through faith in Him!